Fit Momma of Four: Snow Day Coaching - are you ready to work from home? Snow Day Coaching - are you ready to work from home? Snow days have always been happy events for me. Even when I worked outside the home, I was a teacher & it meant another day to be at home with my own kiddos. Today I started thinking about all of those who are not so fortunate. I thought of all the people who had to scramble to find coverage for their school-aged kids & brave the icy roads to get their kids to a sitter & then get to work. Then they probably sit there all day & worry about the road conditions when it was time to go pick up the kids. I am SOOO blessed that I don't have to stress about that & I truly feel for all of you who do. Today I checked in with my challengers, snuggled with my kiddos & pup. Then we played Sorry & trains. While Luke took his nap Noah & I did a workout, I checked my messages & returned some emails...I even got to hear about a challenger's personal success in fitting into a favorite outfit today!! Happy Dance!!! We continued our day by having a yummy, home-cooked family dinner together & we are going to unwind with a little family movie now. We never had to brave the icy roads or even put on real clothes! 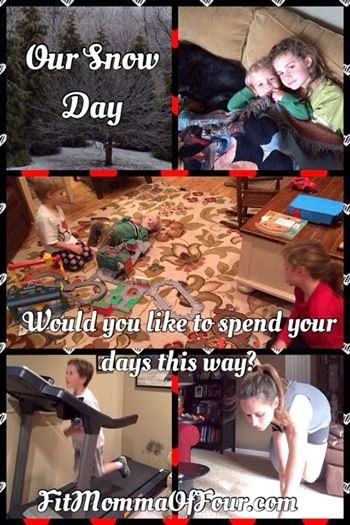 Would you like to have worry-free snow days full of snuggles, games, & good workout all in your comfy clothes? I am looking for FIVE highly motivated individuals who are ready to stop the 9-5 grind & start living life on YOUR TERMS!